PRIZES: The random winner (chosen by Random.org) will receive 3 digi downloads of your choice from the digi store! Katrina~ I decided to combine 4 different images with a sentiment from Polkadoodles Too Cute. My goal was to put it into a comic strip setting with the animals sort of 'escaping' the setting! This was so fun, I can't wait to try this again with some different images! 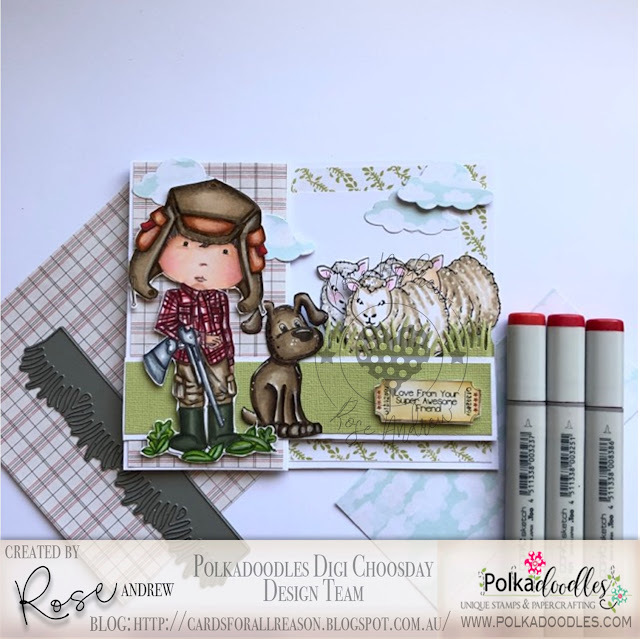 Rose -hello friends in blogland, for this fun challenge I have created a Z-Fold card using the Work & Play 10 Country Life . All my designer papers and images are from the same pack . 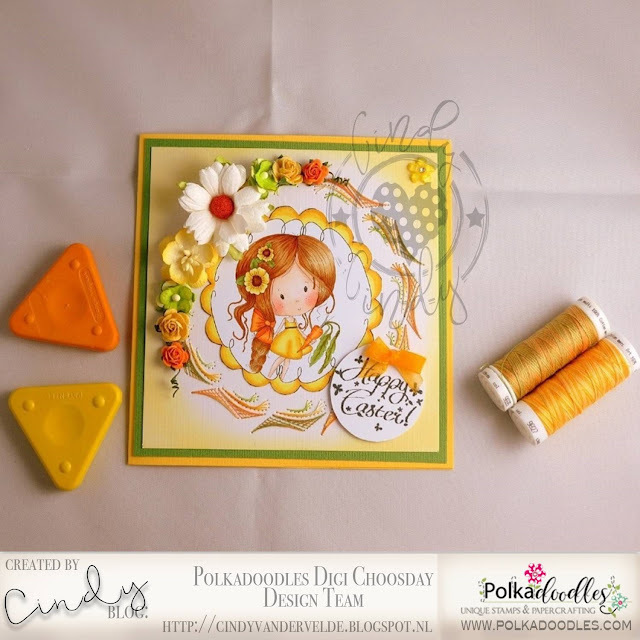 Cindy - Today I went totally out of my comfortzone trying to make a card in mixed mediastyle. 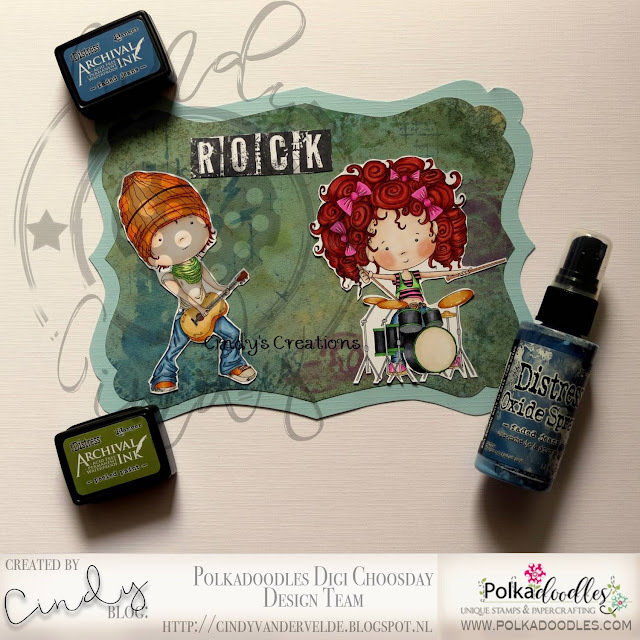 I have used the digi drummer girl and guitar boy. 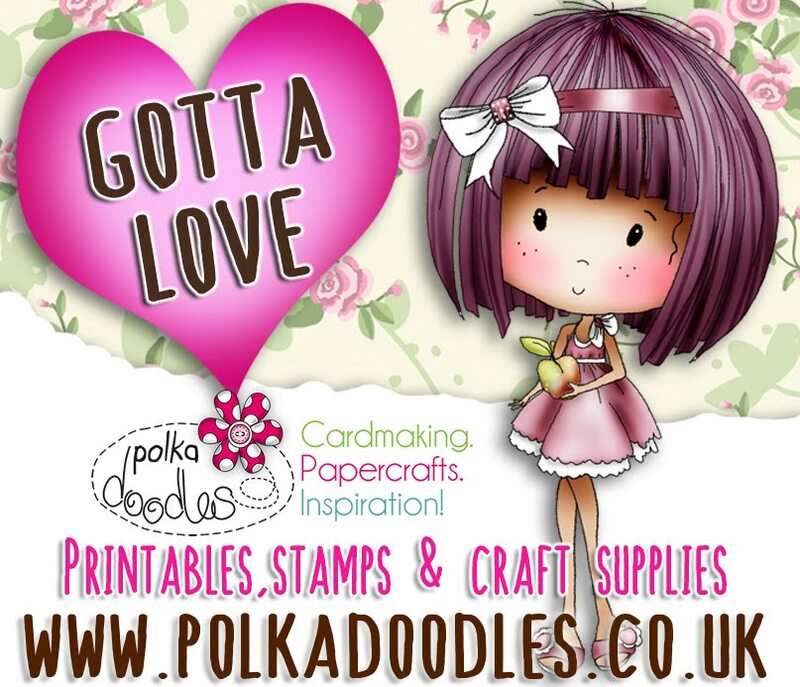 For the background I have used distress oxide spray, archival inkt and several mixed media stamps. 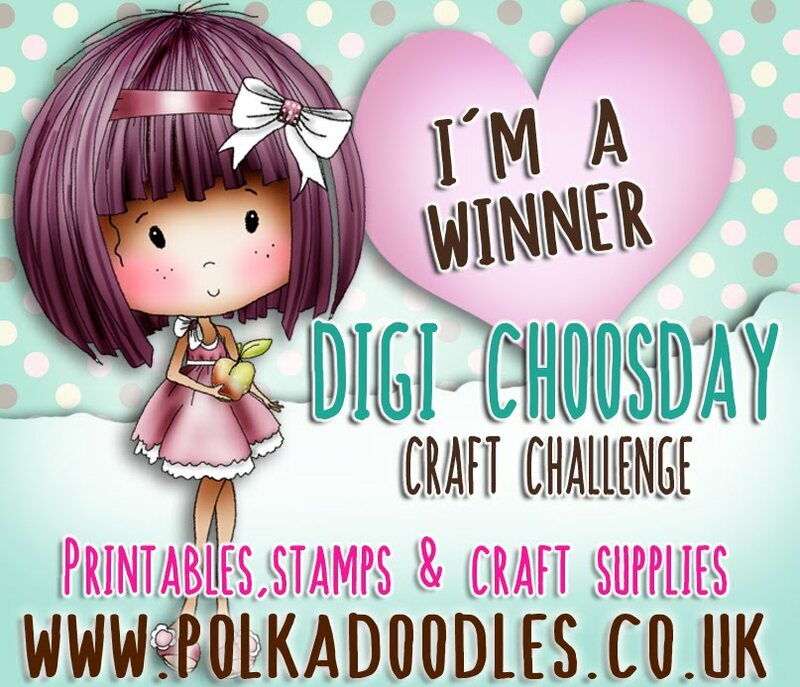 Claim HERE quoting DCW191015 to claim your prize of 3 digi images from the digi store! Let's see what the design team have made for us this week... they were challenged to create projects which were 'INSIDE OUTSIDE'.... whatever they made had to be as important on the inside as it was on the outside - and wow!! they came up with some GREAT ideas and inspiration for you! 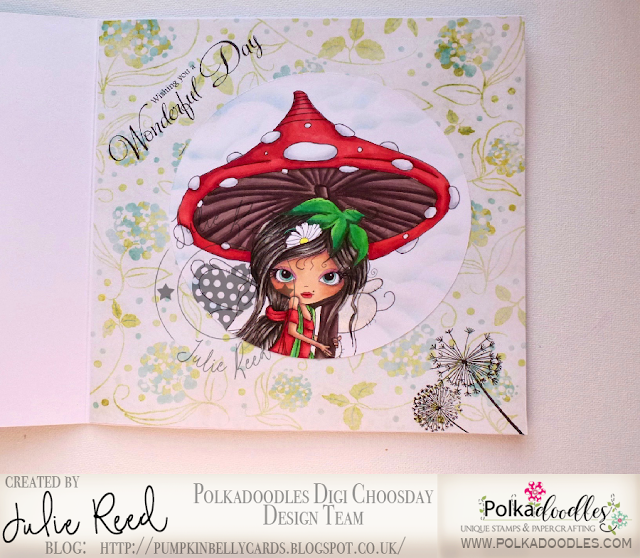 Mary G...For this card I used the lovely Helga Hippo with her gorgeous summer hat. I downloaded and printed out the image, then I coloured it with Copic markers. 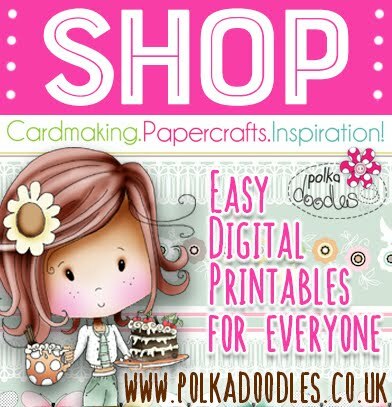 I die cut the image and matted it onto various diecut shapes then added some summer daisy shaped flowers which I stamped and diecut from Polkadoodles digital paper from the Starfish/Sandcastles collection and added a sparkly gem in the centres plus some diecut white leaves. Julie Reed - This week I have decorated both the inside and outside of my card, I have used Octavia Whistful and cropped her using a circle die and created an aperture, so you can see her. The paper inside my card is from the Helga Hippo download collection. My image has been coloured with Copics. Jane S - One thing guaranteed to bring a little sunshine into my life is colour...and lots of it. 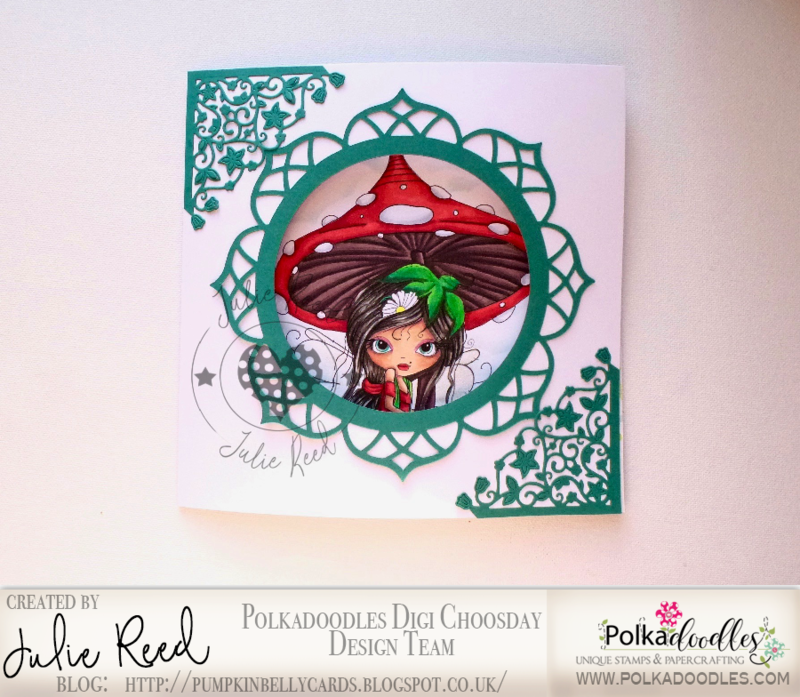 So this week I have used watercolours, Copics and bottled alcohol inks to add a rainbow to my card. The image is the stunning Meribelle Swishy Tail and I cropped the image to place her inside but also added a smaller aperture in the front so you can see her peeping through. 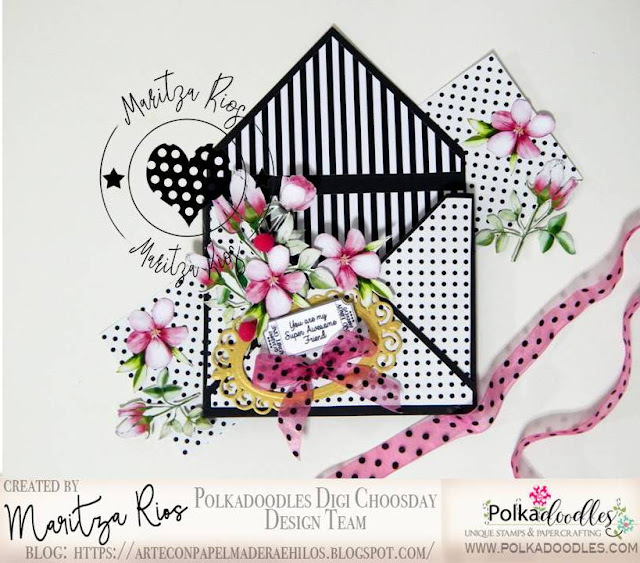 The gorgeous stamps are from the Best of Days Set and the sentiment comes from the Ula's Life Collection. 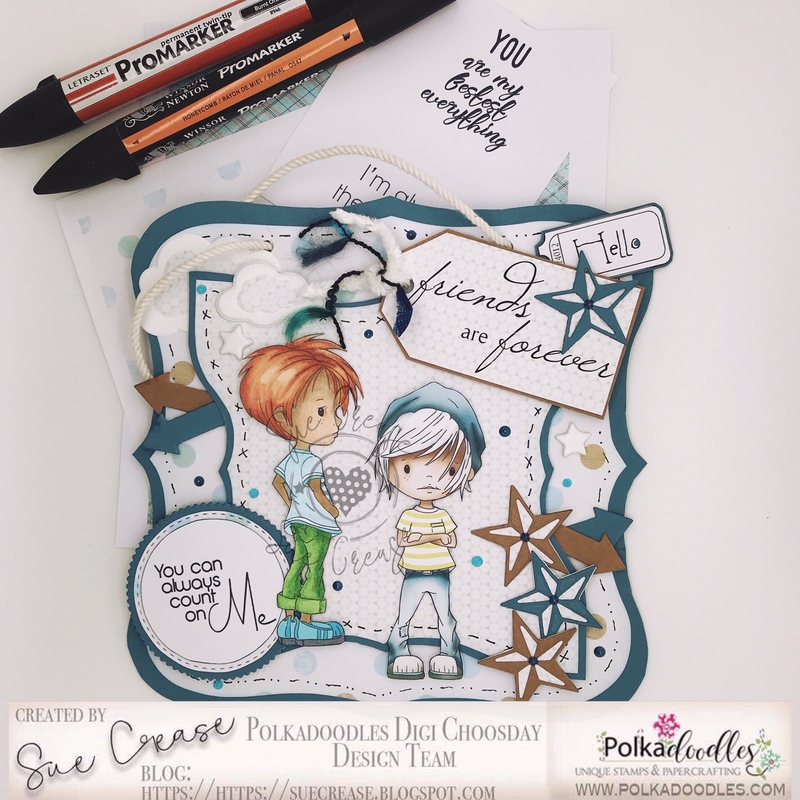 Julie T; For my card I used Winston Bear Gone Fishing. I used the entire image on the inside of the card but cut out just Winston for the front of the card. All the papers are from the Winnie Starfish/Sand Castles 9 pack. 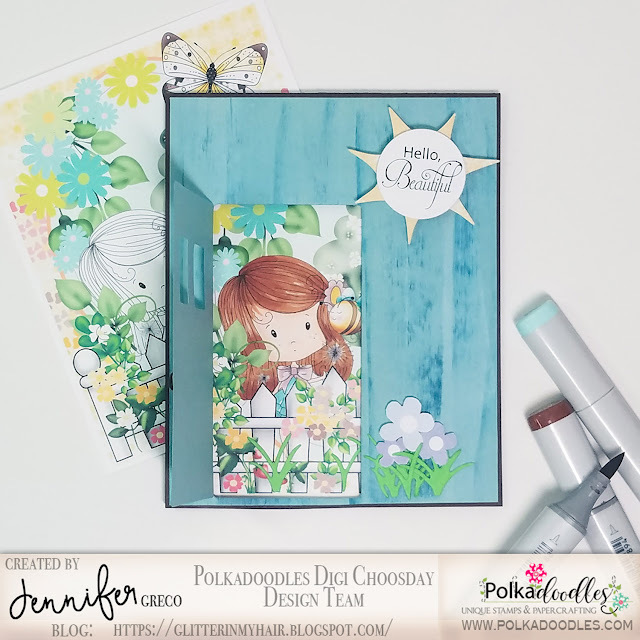 Jennifer - For my inside out card today, I've created a merged scene using the Dandelion Days image, along with the Dandelions design sheet, both from Winnie Fruit Punch. The flowers on the front are from a Helga Hippo design sheet. 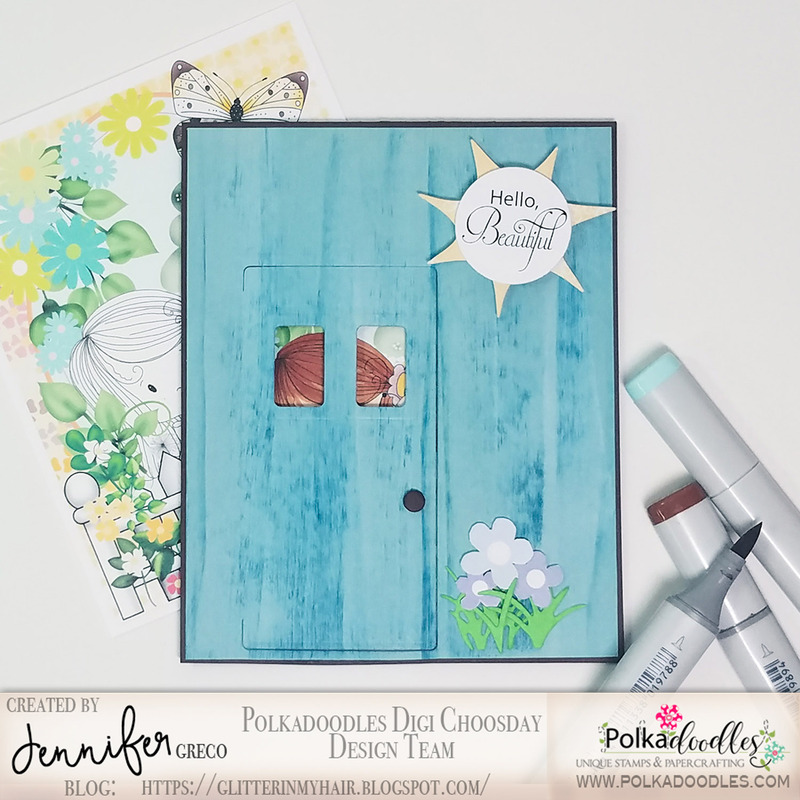 To show Winnie's face peeking through to the front of the card, I've cut the panel using the Versatile Door/Window die set (also available from LDRS Creative). My sentiment on the front is from the Helga Hippo bundle. 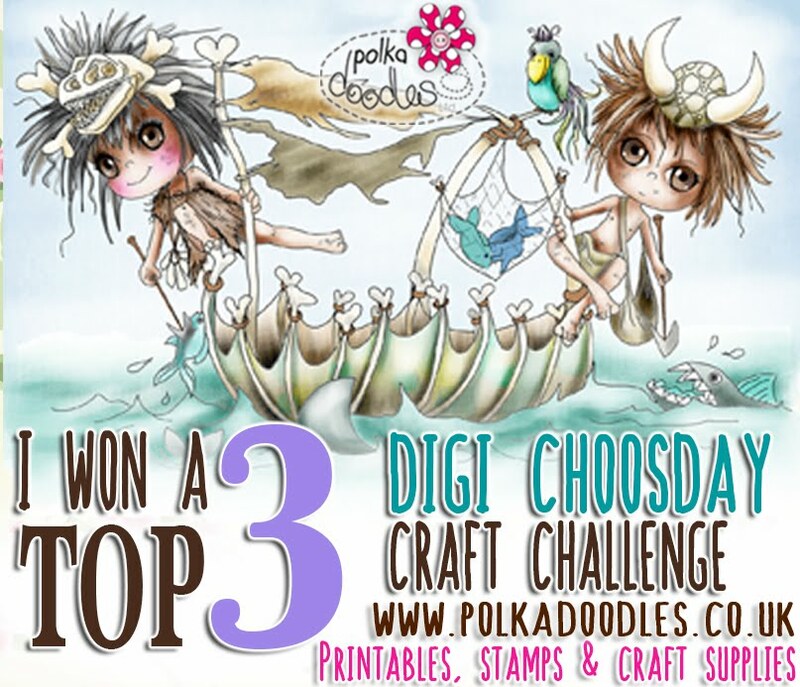 Claim HERE quoting DCW191014 to claim your prize of 3 digi images from the digi store! PRIZE: The random winner (chosen by Random.org) will receive a voucher for 3 digidownloads from the digi store! Jennifer: I've used this TOO CUTE "Somebunny Special" image today to create an adorable Easter card. Sentiment from Winnie Sugar Sprinkles, papers from Sugar Sprinkles, Work & Play 12, and Winnie White Christmas. Julie Reed - This week I have used one of the small digi's as the main image on my card, you can find it in Winnie in Wonderland along with the patterned paper. 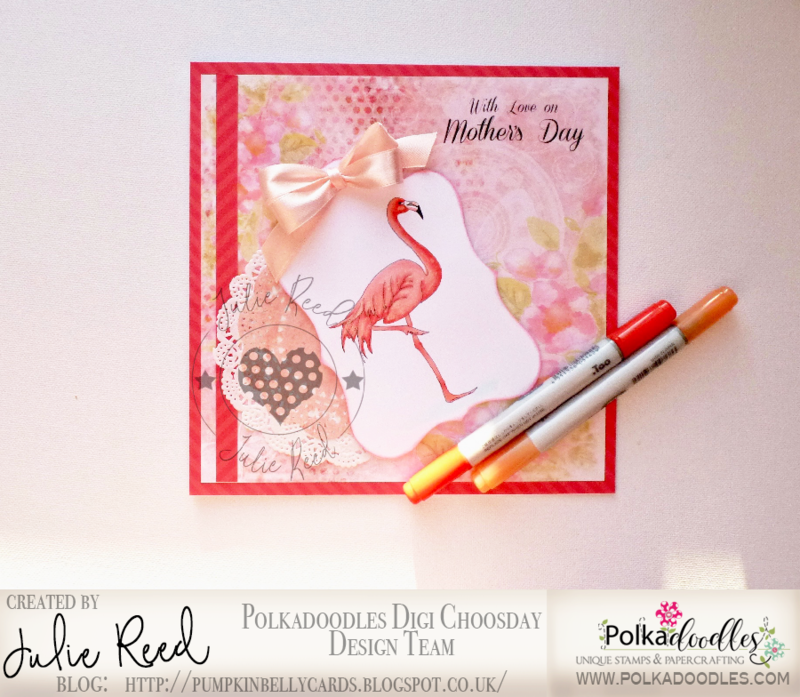 The flamingo is coloured with Copics and covered with Spectrum Noir clear sparkle pen and looks so lovely. 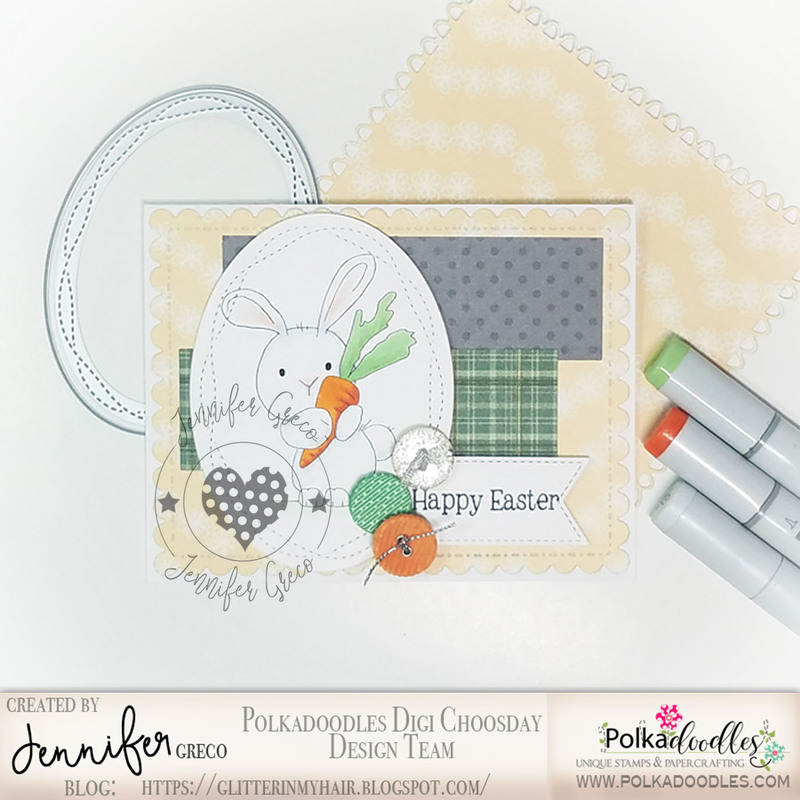 Jane S - I created an Easter tag this time with the fabulous Cool Dude and Happy Woof-day Dog. 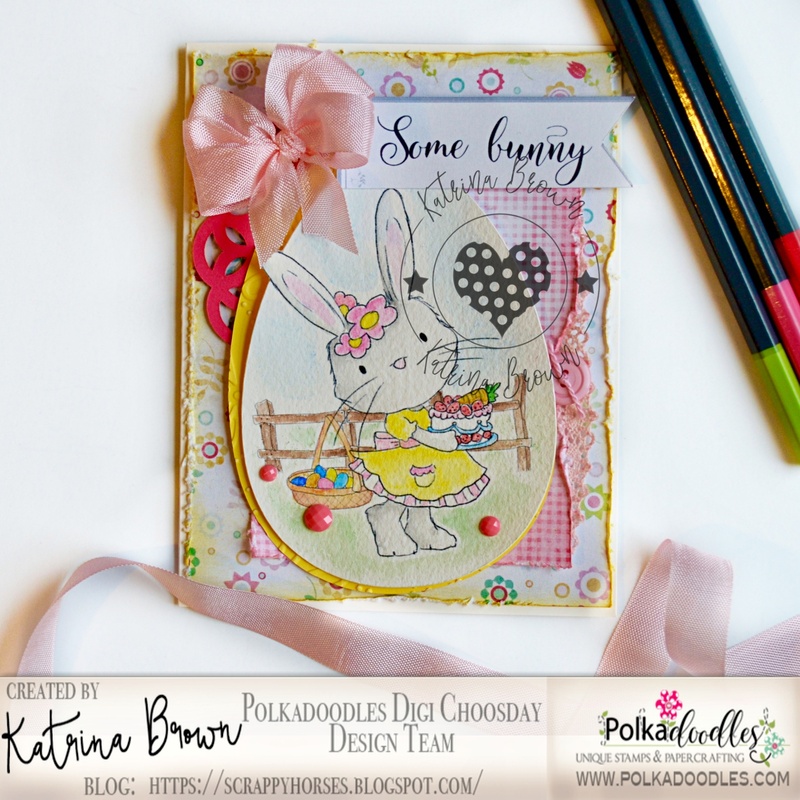 I gave my little dude an Easter bunny costume using the Cottontail Rabbit Die Set and added eggs and a sentiment from Winnie Sugar Sprinkles. 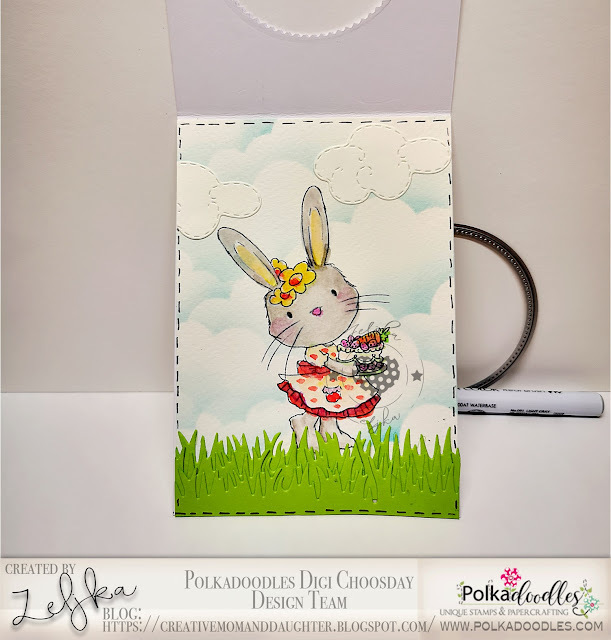 The papers are from the beautiful Just Smile Paper Pack and in the background I used the Magical Grasses Stencil and 24 Carrot Friends Stamp Set. Maria: Good morning !!! For this Tag I used Bunnita Carrot Cake colored with copics. 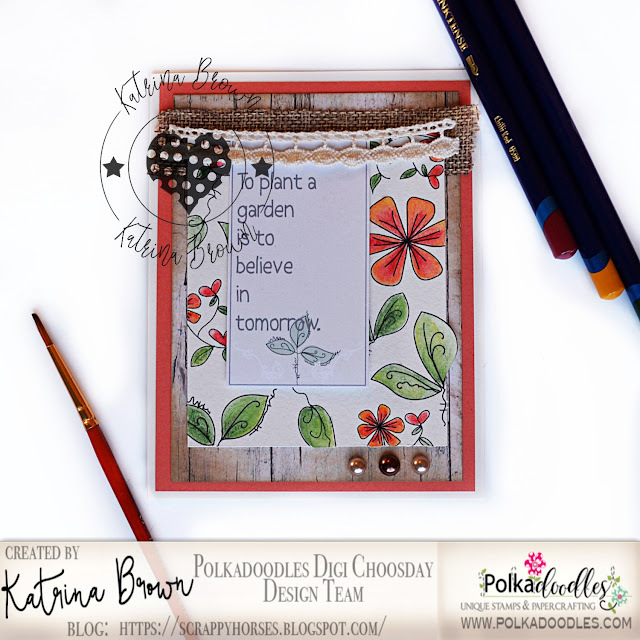 The card collection I used to create the card is part of an Eden Collection Paper Heaven 3 Kit, the sentiment I used and Winnie Sugar Sprinkles Word Art Bundle. 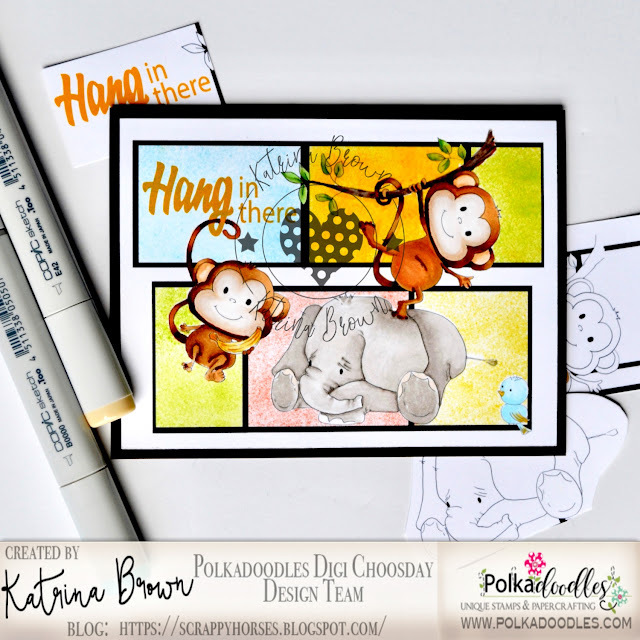 Julie T I used the adorable Winston Bear Etty Mailbox for my card since it features both an animal and a bird. 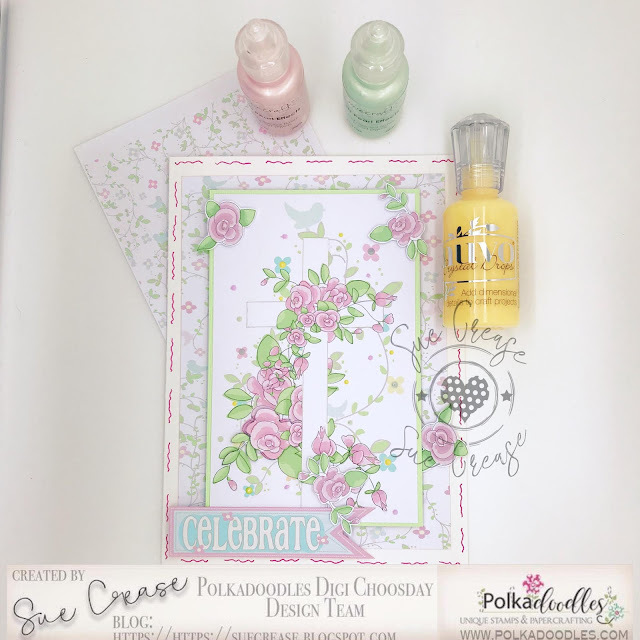 I also used a sentiment from Winnie Celebration 3 bundle since rainbows remind me of spring. All the papers are from Lady Love Bug Paper Heaven 2. Željka -Hello!!! 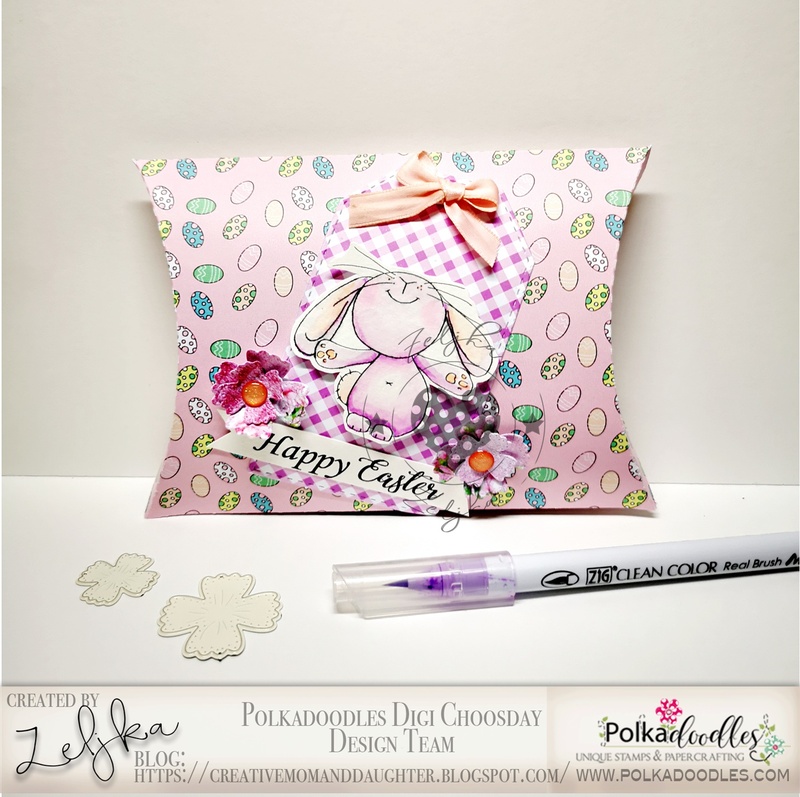 For this week challenge I made a pillow gift box with the papers from FREE Tatty Twinkle Easter and the adorable bunny from Too Cute collection Some Bunny Adores You rabbit . Claim HERE quoting DCW191012 to claim your prize of 3 digi images from the digi store! 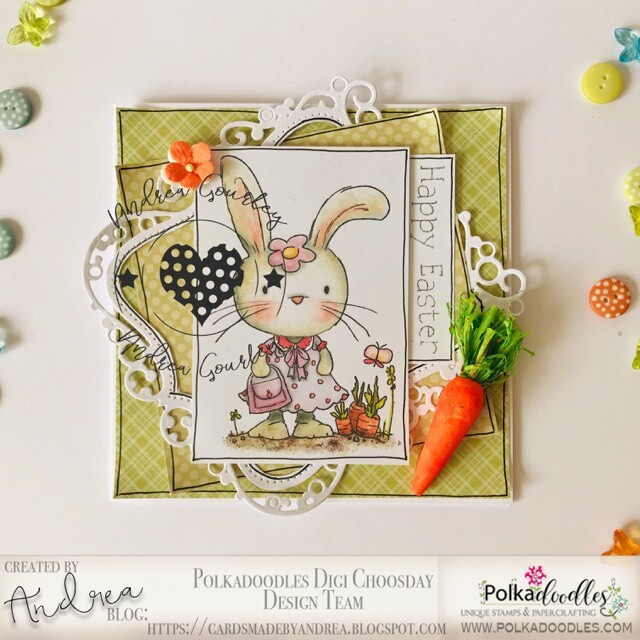 Using image Winnie Sugar Sprinkles Springtime - Happy Easter! 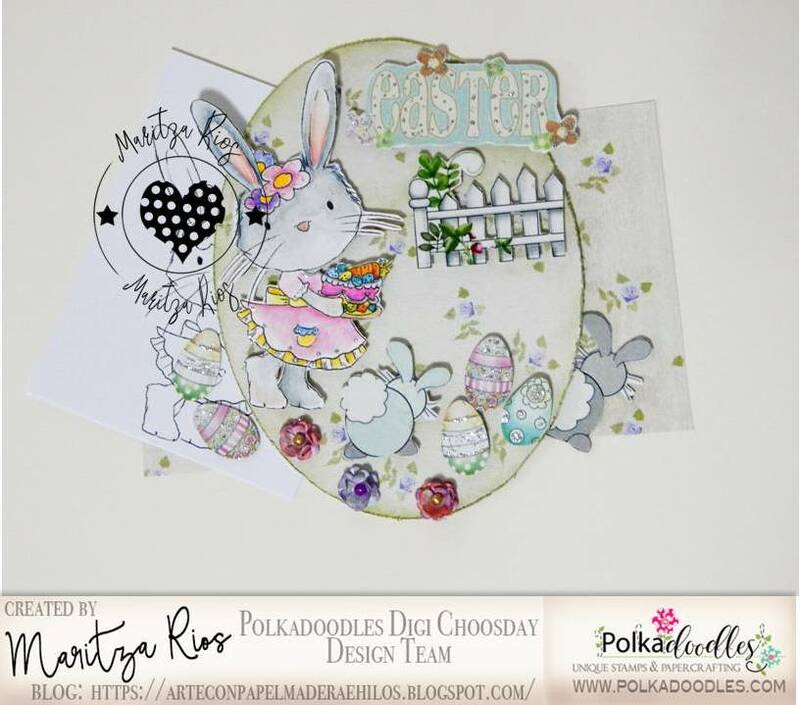 with digital FREE Tatty Twinkle Easter . More details on my blog . 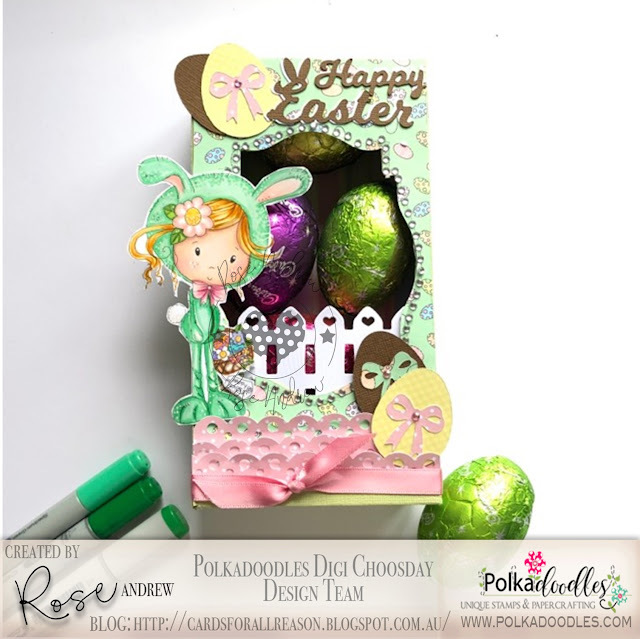 SUEI’m sharing an Easter card I made using images from winnie-sugar sprinkles embellishments kit this is another full-on kit packed with lots of lovely embellishments to use on your spring & summer crafts. I also used papers from Winnie-sugar-sprinkles-paper-heaven-4 . More details on my blog. Katrina~ Easter in the country with egg hunts and family members bringing desserts to Gram's house! 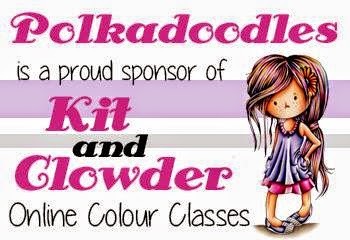 Such fun memories! Here is Bunnita Carrot Cake from Fuzzypuffs taking her cake to the farm. The fence and basket of eggs are from Work & Play 10 Country Life. Jane P - Happy Digi Choosday! 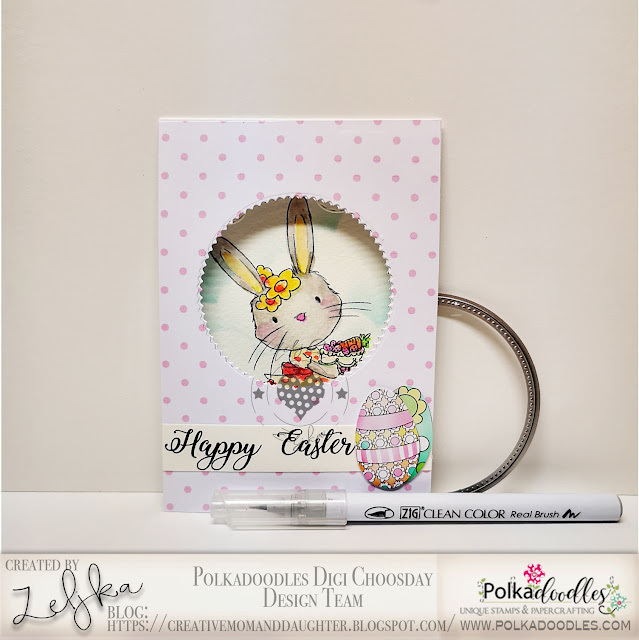 Spring is the the air and Easter is just around the corner. This weeks I have created my card using and image from the Fuzzypuff collection and embellishments from the Winnie Sugar Sprinkles Springtime CD Collection. CindyJust some time left for Easter. Because I also love card embroidery, I decided to combine embroidery and this cute digi of Winnie Sugar Sprinkles Springtime want a carrot. I have colored this sweetie with copics. Don't you just love the colors of spring? Claim HERE quoting DCW191011 to claim your prize of 3 digi images from the digi store!